Our end-to-end PLM services span the full spectrum of strategy, digital, technology and provide tailored industry expertise to our clients. Strategy: We help companies to improve the ROI of their R&D investments by building a PLM business case and roadmap, developing the right innovation and portfolio strategy, defining PLM processes, designing the appropriate R&D operating model and managing organizational change. Learn more about our PLM Strategy Services. Digital: Accenture helps companies seize the opportunity presented by digital technologies, providing analytics based portfolio optimization, PLM in the cloud, and solutions for virtual prototyping and 3D printing among other digital capabilities. Learn more about our Digital PLM Services. Technology: We help companies optimize their technology investments, with the ability to provide customized leading-edge solutions developed through alliances with major PLM technology providers, such as Dassault Systèmes, Aras, PTC, Oracle, SAP and Siemens PLM. Our Technology services also include application architecture design, systems integration, unified ALM–PLM and data migration, to name just a few. Learn more about our PLM Technology Services. Companies remain under pressure to innovate and deliver new products to market faster and at lower cost. At the same time, they must deal with increased product and portfolio complexity affecting product profitability. By building a Product Lifecycle Management (PLM) business case and roadmap, developing the right innovation and portfolio strategy, defining PLM processes, designing the appropriate R&D operating model and managing organizational change, we help companies to improve the ROI of their R&D investments. Accenture helps companies seize the opportunity presented by digital technologies, providing analytics based portfolio optimization, Product Lifecycle Management (PLM) in the cloud, and solutions for virtual prototyping and 3D printing among other digital capabilities. By defining a new R&D operating model, Accenture helped a consumer packaged goods company increase speed-to-market of new products by more than 15 percent and improve R&D efficiency by over 20 percent. Accenture helped an industrial equipment manufacturer reduce time-to-market and generate savings of $20 million through streamlining the R&D process and reducing complexity associated with hardware and software. With the help of Accenture’s Operations services, a leading toy manufacturer was able to significantly reduce costs for supporting and maintaining its PLM system. Accenture’s global presence in 200 countries with over 375,000 employees, thereof more than 10,000 PLM specialists. A high, standardized, level of skills and experiences based on Accenture’s proven methodologies, with capabilities available round-the-clock, round-the-world. 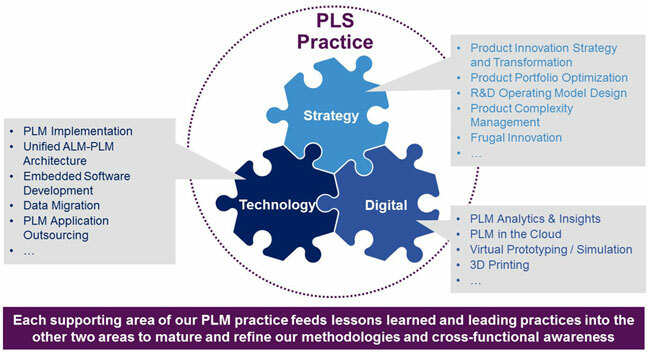 Accenture’s PLM ecosystem of longstanding alliances with major PLM technology providers.